Any.DO has been out on the Android platform for a while now, but came to my attention when it expanded its product line to include the iPhone. There’s a web app now, too, but it’s in closed beta at the moment. The Chrome extension works just fine though, and between it and my iOS devices, I’ve found myself some well-designed, beautiful, and oh-so-functional love. Any.DO shines just about every which way. It’s got a clean, slick and very usable design (in white or black themes), it syncs tasks across devices via the cloud, it has the base functions every task manager needs (reminders, notes, folders/labels, filters), and it does such a good job of getting out of its own way that it is a joy to use. That last bit there — the joy — is key. 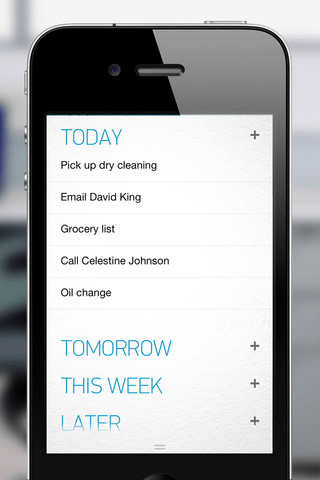 So many to-do apps end up never being used simply because they take too much effort to keep a good flow going. 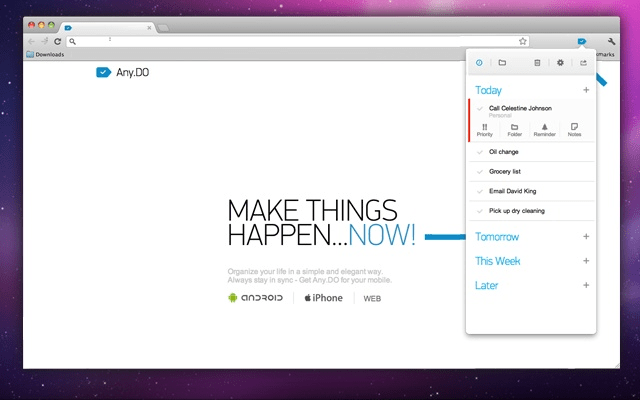 Any.DO makes it easy to get started by including Facebook registration and logon, and even has a cool video tutorial when you first open it up. Once you’re in, things like swiping tasks to complete or un-complete, drag and drop to organize, predictive text, and the ability to add tasks with your voice make you want to stick with it. There are some other nice features as well, such as task sharing via email, Facebook, and Twitter, some contact list integration, and the ability to clear all completed tasks just by shaking your phone. There is also a calendar view when you turn your phone to landscape mode, and — for Android users, anyway — the ability to sync with Google Tasks. Google Tasks sync might come along for other versions, as well, and there has been some mention of adding sync for other services, as well, such as Remember the Milk, Springpad, Producteev, Outlook, etc., but no definitive word on when that might happen, if at all. What Any.DO is missing, at the moment, are connections to Evernote and Google Calendar. Those two things could turn this little app into a powerhouse in its own right — though I have to say, it works pretty damned well all by its lonesome! And it doesn’t hurt that you get all of the awesome that you do get for the oh-so-sweet-and-convenient price of nada. Give it a go. Try Any.DO on your Android device, in your Chrome browser, or on your iPhone (pay no attention to the reviews on the app store — I haven’t had any issue getting the app to work at all). If you like it, let us know — and don’t forget to sign up for the web app beta. You nailed it exactly. I stumbled upon Any.do when SPringpad broke the calendar/task integration in thier last update. I needed to have a dead nuts simple way to quickly add tasks. 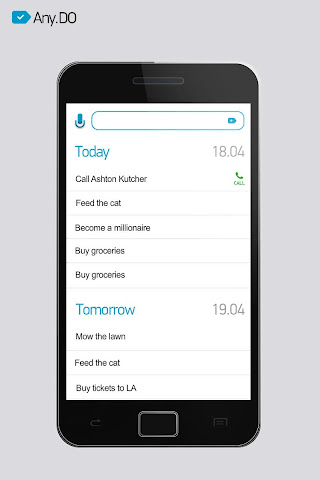 One other neat feature on the mobile side is that you can set it up so that if you miss an incoming call it automatically reminds to to set a call back or to simply ignore the call. I didn’t know about that feature when I started using the Android app – but now it is my favorite part. I just wish I could hide completed tasks without having to delete them. I am a bit of a pack rat when it comes to saving stuff and it would be nice to be able to store that info out of the way. I love it… simple, elegant and easy to use. 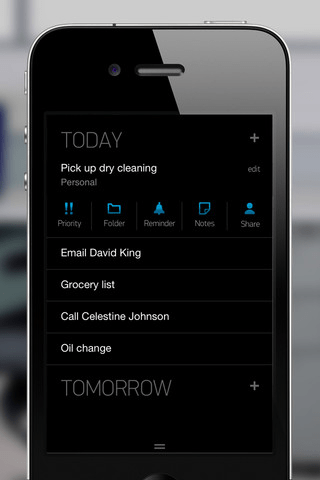 One cool feature that I like but really isn’t advertised is the ability to add sub-tasks in the “notes” section. When you complete a sub-task you can also just swipe it complete. This will help if using a watered down GTD methodology. I was using the 2Do app on my iPhone for a while, its powerful and has a nice interface but it gets a little cumbersome to manage. Thank you for sharing. I will surly try it out. I love Any.Do on the android but I had syncing issues with Google Tasks which I like to use as I like to see tasks on my calendar. Other than that though it’s a fantastic app and if it had the same ability to display on the Calendar as Google Tasks I’d definitely make it my go to task manager. As it is I’m using Team Tasks android which has very tight syncing. Not quite as slick as Any.Do but still looks great and works pretty well.